The PSM318 DJ Monitor delivers outstanding full frequency output, accuracy and immediacy, thereby setting a new benchmark for DJs looking for ultimate stage sound. 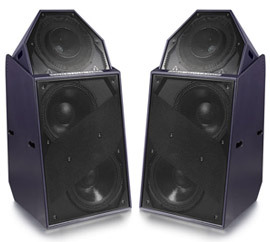 Each two-part PSM318 comprises a new double 18” bass reflex enclosure (PSM318L) providing very strong near-field sub-bass with a separate triple concentric enclosure for the rest of the frequency spectrum (PSM318H). The two enclosures join to form the whole with a clever quick-latch system to provide simple angle adjustment for different monitor positions and DJ heights. The bass enclosure has integral wheels enabling it to be easily moved into the optimum stage position. The triple concentric arrangement of the mid-high enclosure comprises a very high power 18” driver with a coaxially mounted two-way compression driver. The natural materials used in the midrange section of the compression driver give previously unheard clarity and definition to the vocal range. The ultra-fast 18" driver with its Neodymium magnet and 5” voice coil delivers excellent mid-bass definition. The overall design has been optimised to minimise sight line impact. &nbsp;These radical new monitors were first used at Space in Ibiza to widespread acclaim and have also recently been deployed in several ground-breaking clubs State-side as well as on the Ultra stage at the WMC in Miami and other leading Dance Events around the World.